Human fingerprints are translated into numerical symbols, coded through the artist’s drawings and used as symbolic data. Patterns that merge are also to be lost, woven and undone again, in layers adding complexity in the language of code and information architecture. Writing Contributions from Norman Locks and Jimin Lee, UCSC. At a time of collapsing specialization, when disciplinary studies slide, dissolving into one another revealing new knowledge Eleanor Gates-Stuart is creating metaphoric landscapes mapping the markings of patterned language samples signing one another. Eleanor Gates-Stuart digital prints illuminate, in variation, data delivered in layered transparent notation. In the early sketches the first layer printed was the finger print establishing the beginning, recognizing our individual presence, our observations of rivers of characters, numerical, text, blood, microscopic and aerial perspectives. As, within our daily lives, layers of translucent information flow constantly, simultaneous delivery arriving continuously. The fingerprint is a portrait and a graph of our life. Latter evolutions of the image build and suggest varied patterns of thought and understanding. Each day when I entered the digital studio Visiting Artist Eleanor Gates-Stuart was exploring a new series of marks, and having tested them on paper, she sat transferring them to digital memory. The computer and digital technologies was the perfect tool to suspend and imprint the interwoven conversations. 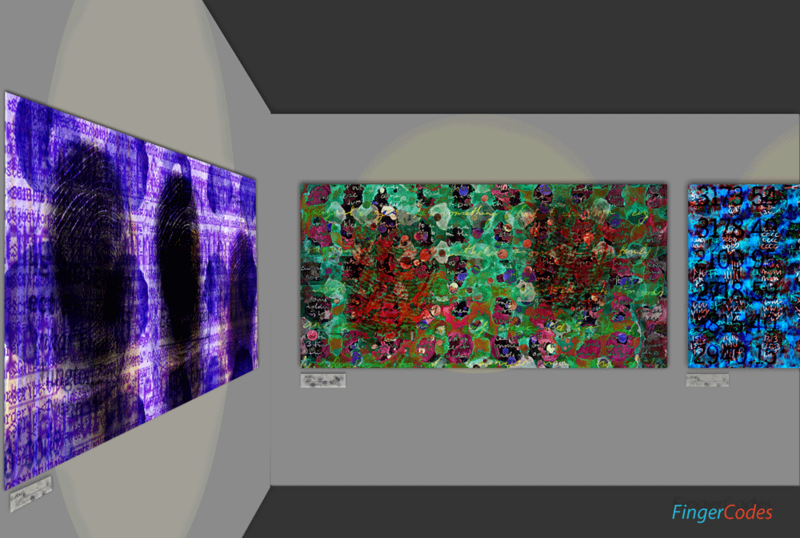 While Eleanor’s final inkjet prints carry the signature of years of art making, looking like a cross between print media and painting, they in fact could not have been created without the computer and associated programs stitching thin pixel layers into streams of information. Examples of complexity in our lives are endless, particular to our own existence, continually related in our own stories about our history and our experiences. While the details of our histories vary we share being human. Eleanor Gates-Stuart creates panoramas that reflect the natural complexity of our lives and the languages we use to express ourselves. She strives to commit seemingly specialized languages to the same page. 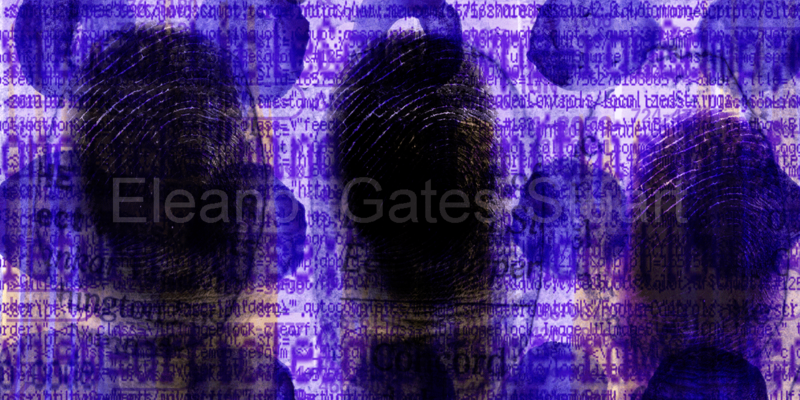 Finger Coding, by Eleanor Gates-Stuart, is a series of artworks with an implied focus on identity and pattern structures, using fingerprint and data-world information. Gates-Stuart’s work introduces text and visual references to data-mapping, making use of extensive research in print and digital media. She creates a series of semi-abstract patterns she calls “finger coding,” using fingerprints as a bas structure of images to which she adds numerical data, code, and her own watercolor drawings and sketches. In this way she adds a symbolic overlay upon the basic identity represented by the fingerprint images to create a new identity, text, or pattern. The resulting prints, as the artist has explained, achieve a kind of aesthetic balance that unifies both systematic and chaotic elements. They also show a fine sense of color and the harmony of serial images. One of the nice things about her work is that she allows the beautiful, subtle marks of watercolor brush strokes to be incorporated into her prints, human marks with the relatively cold digital techniques she uses. This action is really important. While the fingerprints may be an individual expression of identity, the layering of personal drawings, images, and brush marks creates her own very human identity code. Thus the usual roles are reversed, and, in Gates-Stuart’s work, fingerprints become more an abstract element and the personal marks, drawings, brush strokes, and so on become the true fingerprint.